War2.ru is completely free, nonprofit, and relies on volunteers who donate their time & money to keep it running. Every individual contribution counts, no matter how small, and there are lots of different ways you can help out to improve the server & attract new players. 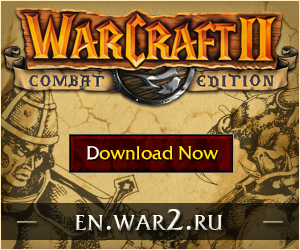 If you have a website or blog then please consider linking to our site and recommending Warcraft 2 to your visitors. Links help improve our rankings in search engines and allow us to reach a wider audience. Copy & paste the provided HTML code to embed these links in your site. 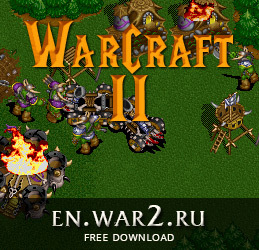 War2TV is our custom site for aggregating Warcraft 2 live streams on Twitch.tv. This small embeddable badge will indicate when one of our streamers is currently playing a match & also the name of the map being played. Shortlinks are short, easy to remember redirect links that we’ve created for the most useful pages of the site. You can memorize a few and use them to give quick advice to players who are having problems. For example, if someone needs help fixing hosting or installing the ddraw fix you can direct them to en.war2.ru/hosting or en.war2.ru/ddraw rather than having to remember the full URL or telling them it’s “somewhere on the website”. Your monetary contribution goes towards things like server hosting fees, advertising, prizes for tournies, and developing new features like the anti-hack. If you’d like the money you send to be used in a specific way feel free to specify when you donate. Donations are accepted via PayPal and BTC. Designing graphics for the server & website, e.g. banners for linking to the site or custom client tags for tournies. Writing tutorials, strategy guides, or any other content we can use on the site to help educate new players about WC2. If you see any section on the site that’s missing content feel free to write it yourself and send it in! Tell everyone you ever meet about how great WC2 is –- use instant messengers, chat rooms, forums, Craigslist, flyers, people you know in real life, people you don’t know in real life – everyone! Walk up to strangers and tell them about War2.ru! If you’re interested in writing content, creating banners or contributing in other ways then get in touch!